Home Reading	The New PJ Masks Magazine: Catboy, Owlette & Gekko Have Landed! Fin loves a magazine! He especially loves the freebies that they always have on the front…what child doesn’t?! I was recently sent Issue 1 of the brand new PJ Masks magazine to review with Fin. To say he was excited was an understatement. 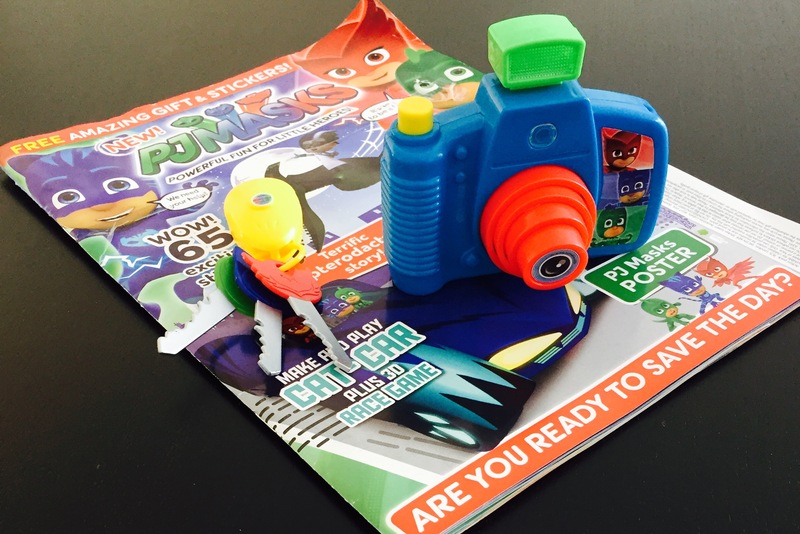 The magazine came with some great toys on the front, including a disc shooter, a camera and a set of character-shaped keys. I presented the magazine to Fin when we went for breakfast with family, to keep him occupied for a while, and he played with the shooter for over an hour with his cousin. Indi liked the keys, which having been covered in dribble (Indi is 9 months old, and puts EVERYTHING in her mouth) promptly fell into a cup of tea. A generous offering of freebies were included, which I think would suit the magazine’s recomended age range of 3 – 5. A vibrant set of pages include stickers, posters, puzzles, colouring, stories, things to make, such as a Cat-Car, and games. The new PJ Masks magazine is now available from supermarkets and newsagents across the UK, and at only £2.99, including all those fab toys and things to do with your children, it’s a great price.